Some people take these steps in their daily lives. 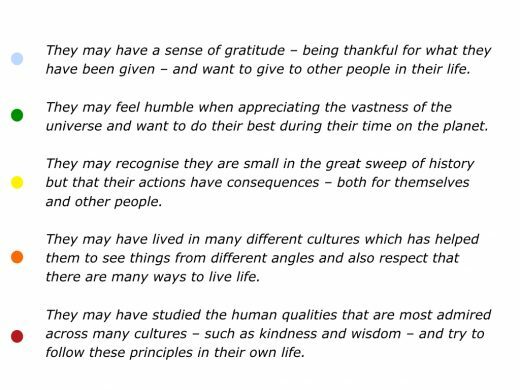 They aim to appreciate life, be kind and encourage other people. They continue to be curious, gather knowledge and try to see the big picture. They aim to do positive things during their time on the planet. People can also gain strength by having a sense of perspective. There are several definitions for perspective. When it comes to daily life, however, here are some of the dictionary definitions. To think about a situation or a problem in a wise and reasonable way. To keep a sense of proportion and understand the relative importance of things in life. To see the big picture, understand what is happening and make wise decisions. To recognise that they may be small in the great sweep of history but that their actions do have consequences – both for themselves and other people. To continue to learn, make sense of life and develop. To serve something greater than themselves – such as a spiritual faith, a purpose or a sense of vocation. Malala Yousafzai is somebody who took some of these steps. She believes passionately in women having the right to an education. The Taliban ordered her to be executed, but she recovered and went on to be awarded the Nobel Peace Prize. David Letterman interviewed Malala about her view of life and whether she had a sense of purpose. She answered in the following way. When I woke up and realised that I had survived such a brutal attack – and I saw death so close – I realised that maybe this life is for a purpose. I decided that I’ll give this life to girls’ education, and speak out for them, and give it purpose. Because we have to die one day, and so why not do good and do as much as we can to help others? Malala explains her journey in more detail on her website. Here are some excerpts. I had the choice to stay silent and be killed or to speak up and be killed. Let us pick up our books and our pens, they are the most powerful weapons. 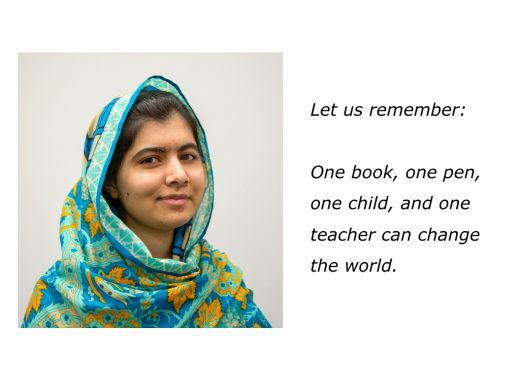 One child, one teacher, one book, one pen can change the world. The extremists are afraid of books and pens, the power of education frightens them. They are afraid of women. She and her father set up The Malala Fund in 2013. You can read more about its aims via the following link. Imagine that you want to follow a passion and do something that helps other people or the planet. This could be something you want to do in your personal or professional life. You may feel passionately about encouraging people, passing on knowledge, creating beauty or working for human rights. You may want to help people improve their wellbeing, find satisfying work or have access to clean water. You may feel passionately about another activity or you may believe in a particular cause. One point is worth mentioning. Here we are talking about a passion you would like to pursue. It does not mean you will be the world’s best at the activity. You would like to follow this passion, however, and translate it into making a contribution to people or the planet. 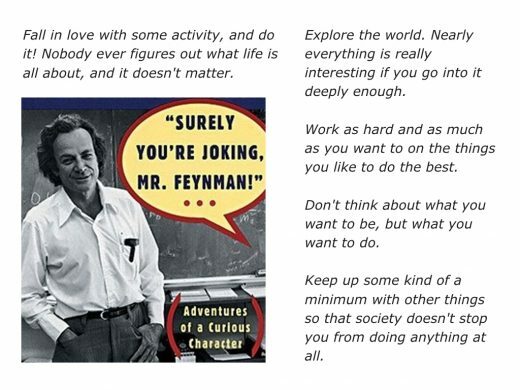 Richard Feynman encouraged people to take this step and do what they love. He believed that sometimes this exploration may take us to different places. Sometimes we don’t know where we will end up, but at least we will enjoy the journey. To clarify the specific passion in which you have the ability to perform superb work and deliver success. To clarify how you can translate this passion into a specific product or service that can help people – customers or employers – to achieve success. To clarify the practical steps you can take to reach these people, perform superb work and help them to achieve success. Sometimes you may follow a passion and it eventually turns into a profession. This may happen because you pursue a path you find fascinating and then opportunities appear. You then translate this passion into doing paid work. In this article, however, we are looking at how you may want to follow a passion to make a contribution. This may be by doing something relatively small, but it may still help people or the planet. 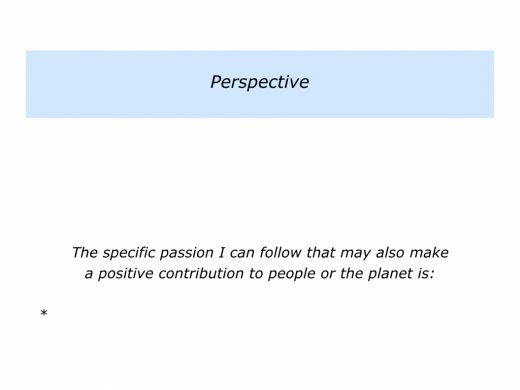 Describe a specific passion you can follow that may also make a positive contribution to people or the planet. Describe the specific things you can do to follow this passion and make a positive contribution. Imagine that you have decided to follow a passion. 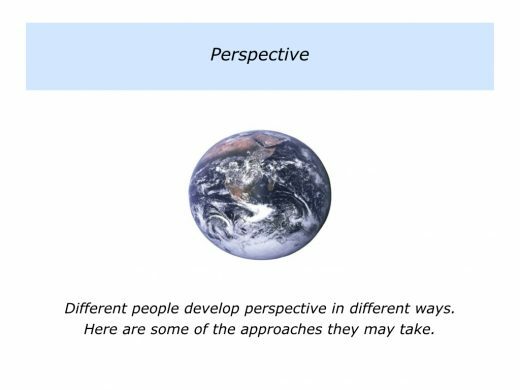 Whilst it will be vital to be positively engaged, it may also be useful to have a sense of perspective. The work you are doing may be serious, but it can be useful not to take yourself too seriously. Paradoxically, this can free you to do good work. One person explained this in the following way. The work is important, but I am not important. Different people develop this ability in different ways. Some of these approaches are summarised in the section below. You will, of course, find you own way to see things in perspective. Different people develop this awareness in different ways. 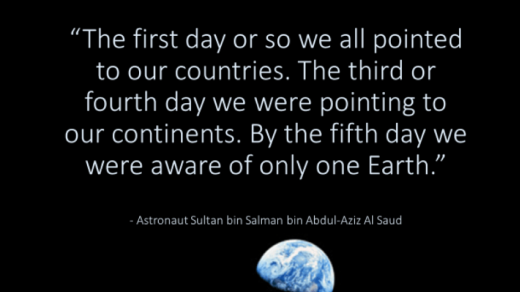 Some astronauts, for example, describe how the experience helped them to see the Earth as a whole system. Here are quotes from two astronauts. I really believe that if the political leaders of the world could see their planet from a distance of 100,000 miles their outlook could be fundamentally changed. That all-important border would be invisible, that noisy argument silenced. The tiny globe would continue to turn, serenely ignoring its subdivisions, presenting a unified façade that would cry out for unified understanding, for homogeneous treatment. The earth must become as it appears: blue and white, not capitalist or Communist; blue and white, not rich or poor; blue and white, not envious or envied. JK Rowling went through difficult times but focused on what she believed was important in life. Speaking to 15,000 people at the 2008 Harvard Graduation ceremony, she described the benefits of failure and seeing things in perspective. She explained this in the following way. Half my lifetime ago, I was striking an uneasy balance between the ambition I had for myself and what those closest to me expected of me. I was convinced the only thing I wanted to do was write novels. However, my parents, both of whom came from impoverished backgrounds and neither of whom had been to college, took the view my over-active imagination was an amusing quirk that could never pay a mortgage, or secure a pension. What I feared most was not poverty, but failure. I think it fair to say that by any conventional measure, a mere seven years after my graduation day, I had failed on an epic scale. An exceptionally short-lived marriage had imploded, I was jobless, a lone parent, and as poor as it is possible to be in modern Britain, without being homeless. The fears my parents had for me, and that I had for myself, had come to pass, and by every usual standard, I was the biggest failure I knew. I stopped pretending to myself that I was anything other than what I was, and began to direct all my energy into finishing the only work that mattered to me. I was set free, because my greatest fear had already been realised and I was still alive, and I still had a daughter I adored, an old typewriter and a big idea. The knowledge that you have emerged wiser and stronger from setbacks means you are, ever after, secure in your ability to survive. Such knowledge is a true gift, for all that it is painfully won, and has been worth more to me than any qualification. Let’s return to your own life and work. Imagine that you have chosen to focus on pursing a specific activity. What can you do to maintain perspective when taking this path? Describe the specific things you can do to maintain perspective when pursuing this passion. 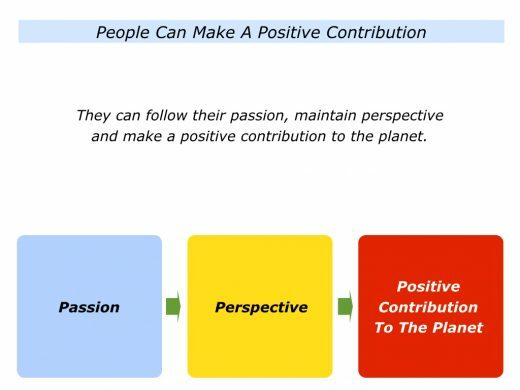 Different people choose different ways to follow their passion and make a positive contribution. 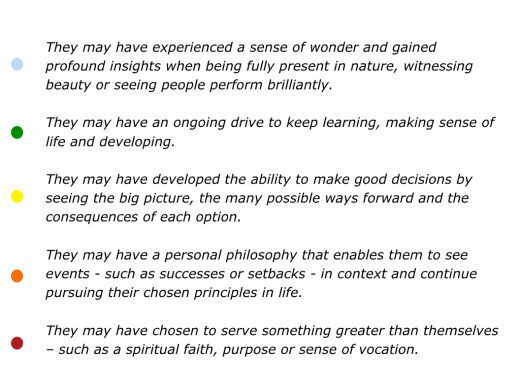 Let’s look at several people who have chosen their own paths. 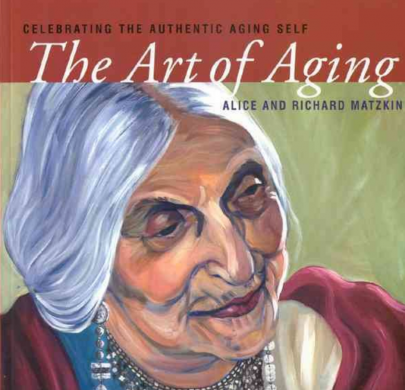 Alice and Richard Matzki are both artists who chose to explore aging. They embarked on a series of projects that confronted their fears and curiosity about growing old. This involved exploring physical changes, spirituality and death. Drawing on their personal experiences and the wisdom of older mentors, they concluded that their elder years could be a time of ripening. It could be a time of harvesting rather than stagnation or despair. Below is their mission statement from their website. This is followed by a video in which they describe their approach. You can discover more via the following link. As part of our personal growth and our responsibility as elders, our intention is to share what we have learned about growing older. By exhibiting our art, speaking and writing, we intend to spread the important message that aging is not the end of life, but can be a positive new beginning and the crowning culmination of a lifetime. Many people are now choosing to become social entrepreneurs. They aim to do good work that helps people or the planet. There are also many organisations that support such people. Echoing Green is such an organisation. Founded in 1987 by the leaders of General Atlantic, it has since supported more than 500 social entrepreneurs who have worked to improve life on the planet. Below is an excerpt from its website. This is followed by a video that provides an insight into some of the activities it supports. You can discover more via the following link. There are many ways to live life. One approach is to follow your passion, maintain perspective and make a contribution. The contribution may seem small, but it can still make a positive difference. Loren Eiseley inspired many people to take this approach with his story called The Star Thrower. Here is one version that was adapted for educators. Describe the specific contribution you can make by following this passion. Describe the specific benefits of making this contribution.